How I love the Polaroid. Most photographers do. I shoot it less and less these days—my stock of Type 55 is getting low. It used to be that I went through boxes and boxes of this stuff. It was the norm for us to go through 20-30 boxes on a shoot. Mostly I used it for composing and proofing but sometimes as the final product. 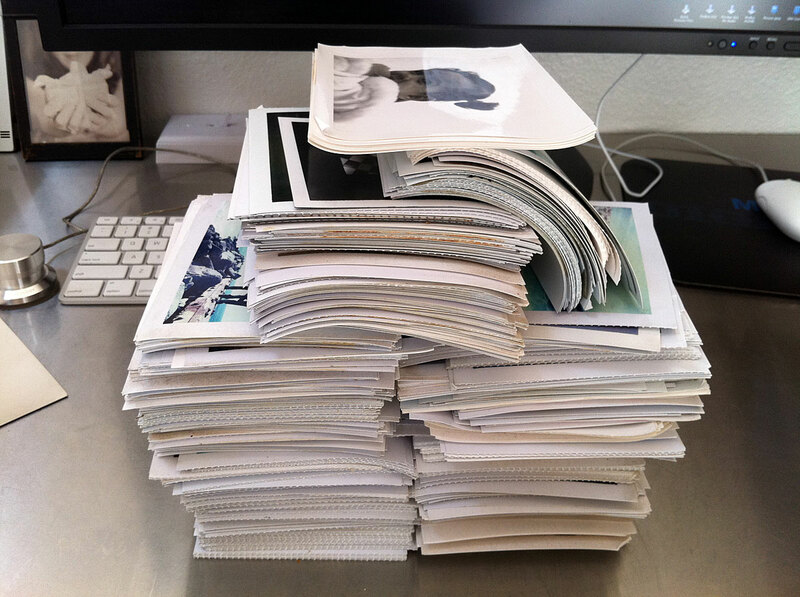 Especially the 8×10 Polaroid you can scan and make a 24 x 30 print, no problem. 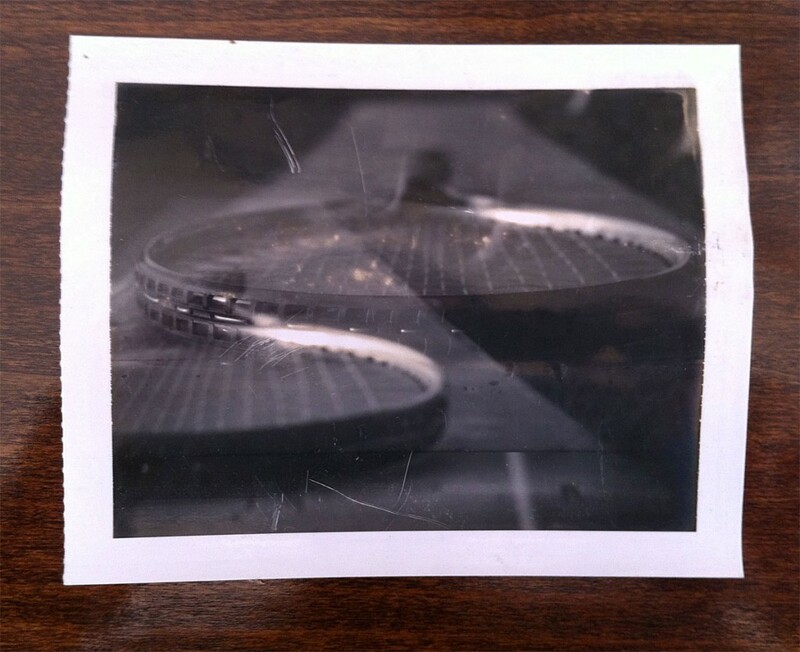 The sheet film Polaroids are very sharp—something not usually associated with Polaroids. Lots of guys used Type 55 specifically to check focus on the razor sharp negative that it produced. The Polaroid has that “look” that is so organic and beautiful. It’s hard to duplicate that look with digital or even with the Fujiroids—it can be done but it’s a whole other process that takes place with agonizing ones and zeros instead of shoot, pull, wait, peel, amazement. This one I actually shot a couple days ago. 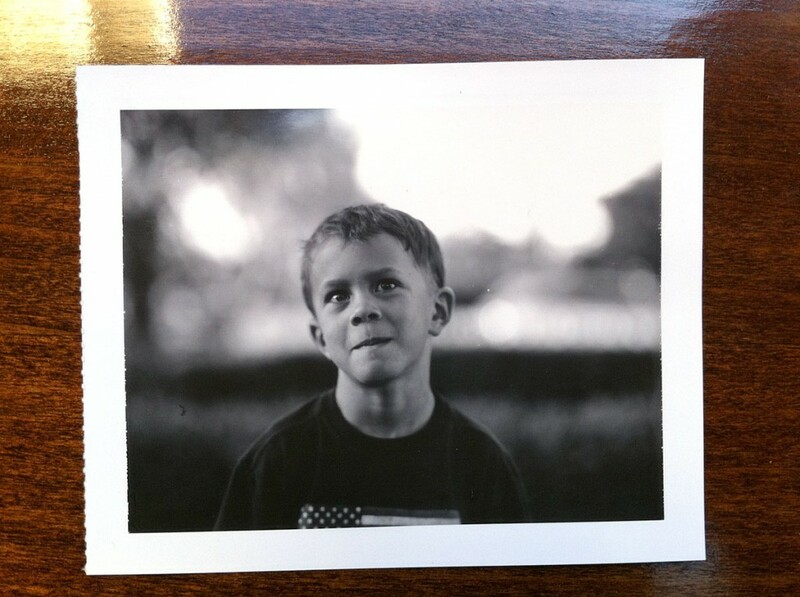 I think it’s the first time my son ever really saw me use a film camera. He was intrigued by the Polaroids as I peeled each one. He kept all of them and put them on his nightstand next to his bed. He asks me almost every day to shoot more. This is from the first shot I ever took with a Graflex D. Andy Anderson handed me the D with a 190mm f1.9 lens (still won’t tell me where he got that lens). After the first shot I was hooked on this camera. I have half a dozen Ds now. For a while this was one of my main commercial shooting cameras. There’s a lot of shots in my portfolio from this camera. I’ve only shot a wedding once and it was for a great friend of mine, Matt Celli. He asked me to shoot his wedding and I said that would not be a good idea—wedding guys are a whole other specialty that I know nothing about. But I did bring a few boxes of Type 55 and the Graflex D to shoot a few shots for him. During the ceremony he kept hearing the massive shutter of the D going “klunk” and almost started laughing. I shot about 50 sheets and made 11×14 prints of half of them and put them in a portfolio for him the week after the wedding. It turned out to be his temporary wedding album for about 6 months while the wedding photographer took her sweet time with her prints. Another shot from Matt’s wedding. This is what happens if you don’t coat Type 55 prints and leave them on a shelf for 5 years. 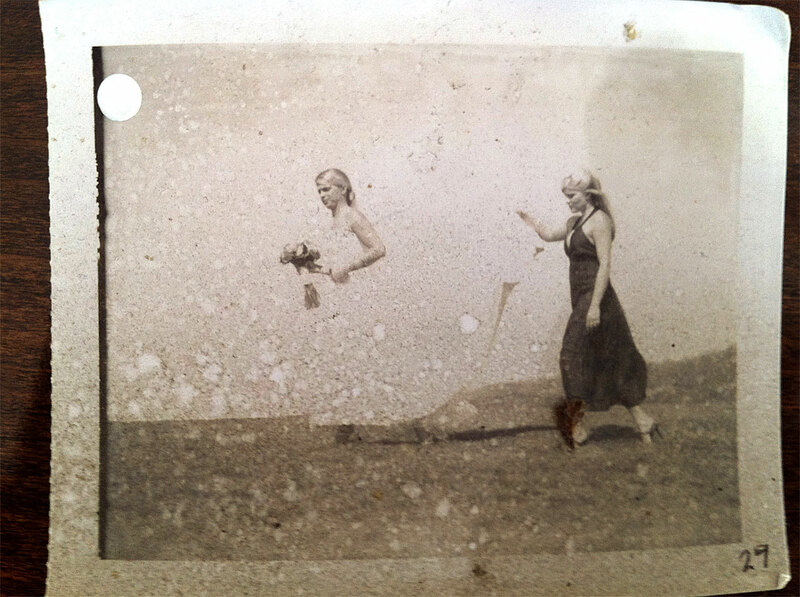 The beauty of Type 55 film was that it made both a print and negative. 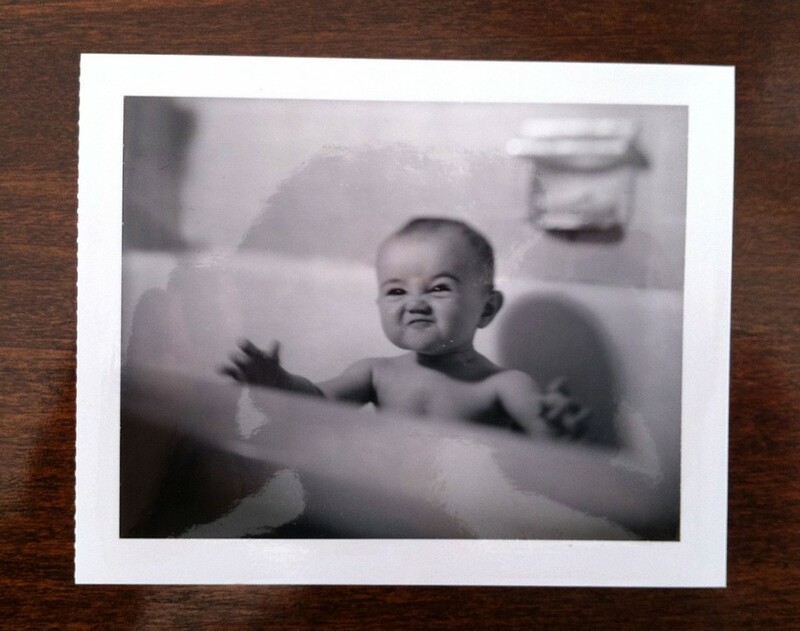 During the wedding I kept a small tub of water under my chair and after I peeled each Polaroid, I gave the print to my wife and then stuck the negative in the tub to keep it safe until I could properly rinse and dry it later. This is from a commercial shoot. 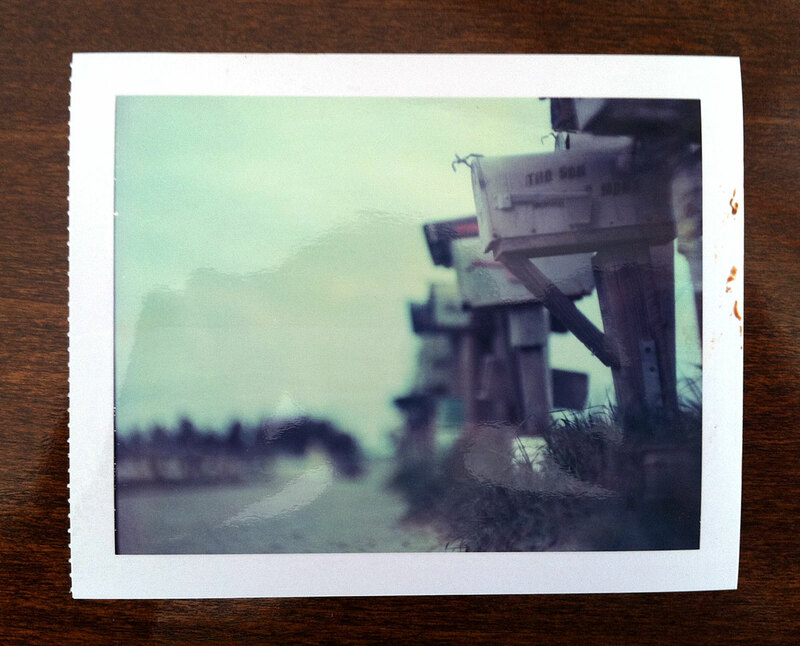 Type 59 was the best color Polaroid film—the color was fantastic. 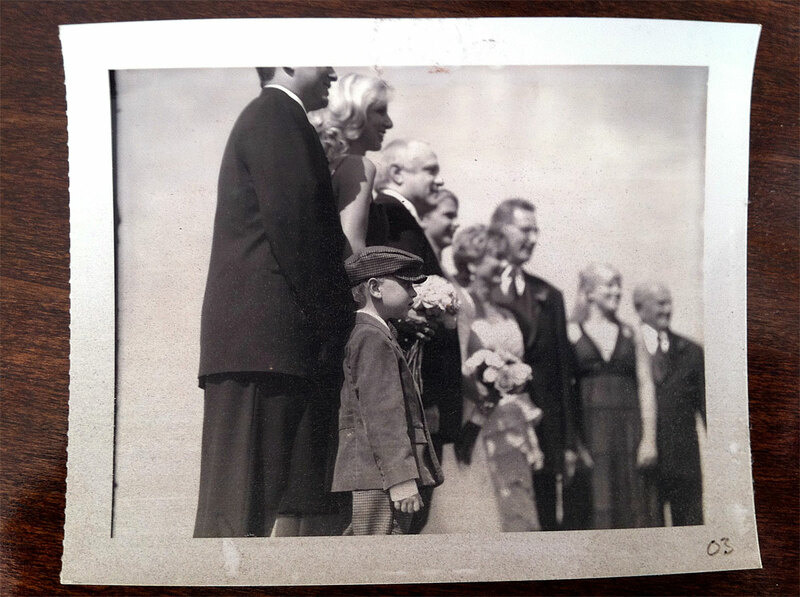 Many times I would print my film to look like the Polaroid. This one was from a commercial shoot. Everyone looks nice and warm waiting for me while I check my exposure. The reality was that we shot this in November in Cape Cod at seven in the morning and they are all freezing their butts off. 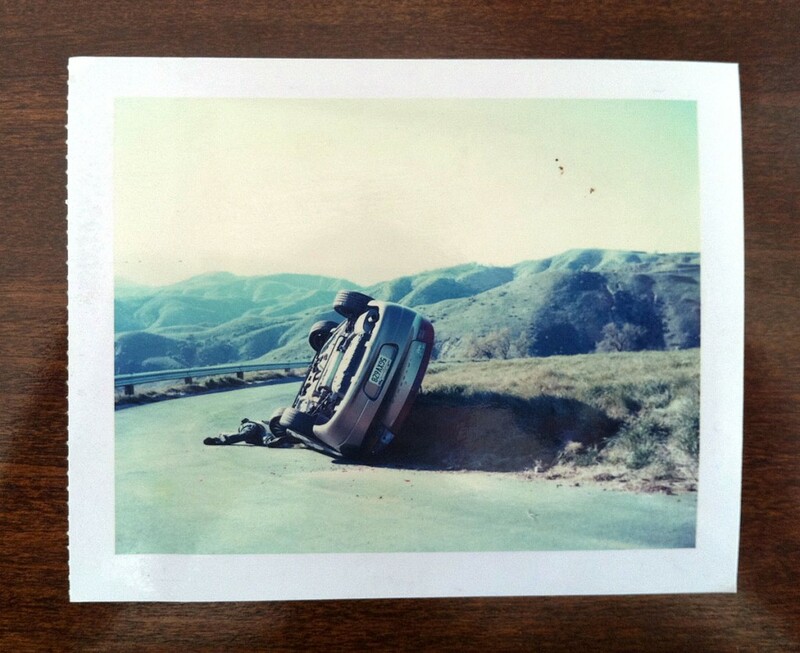 Here’s a case where the Polaroid color was ideal to me but when I printed the film I couldn’t get it to match. I think I’ll have to dig up the film and scan it again and give it another shot. I’m so glad I still have this Polaroid. This is from a commercial shoot where we got to spend a week destroying things. You can see my assistant laying on the ground clowning around. Good times. I completely forgot about this until I saw the Polaroid today. We were shooting this job for the United States Tennis Association. 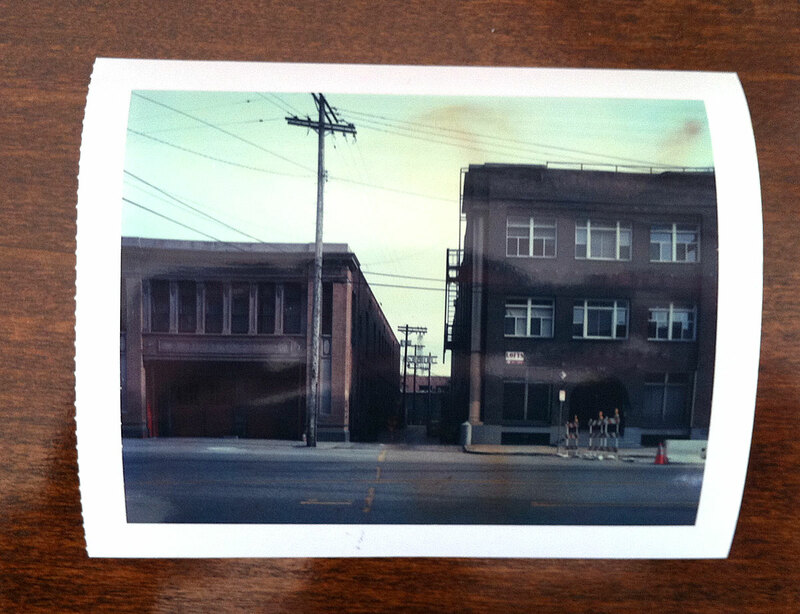 Every once in a while I would get ghosted images on the Polaroid. We could not figure out what was going on. The ghosted images were never exactly the same. 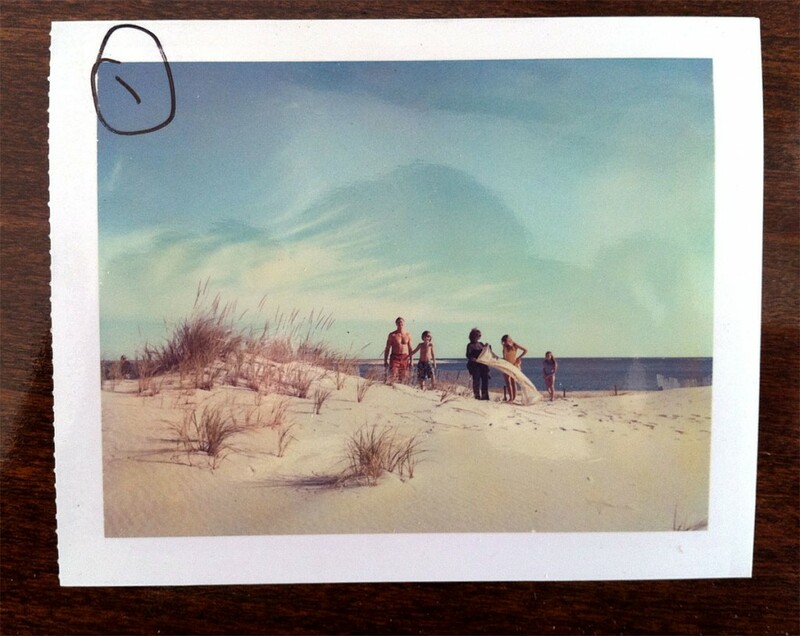 Could we have forgotten to pull a Polaroid and then exposed a second shot over it? Maybe once that could happen. But not over and over all day long. We finally figured that a tiny screw had made its way out of the lens board on my 150mm lens and what we were getting was the shot from the lens but also a pin hole camera shot from the screw hole. 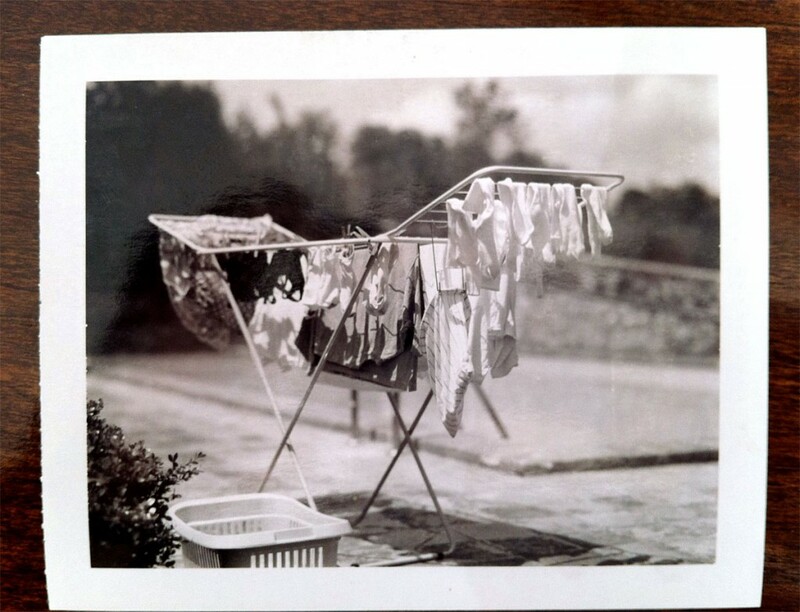 Even my laundry drying by the pool in Italy looks good on Polaroid. My daughter doing her “loud kitty” impression in the bath tub.